Download application form for Ministry of Pakistan Railways Jobs Via OTS from here. Last date to apply is Tuesday, 5th February, 2019. Pakistan Railways is the national, state-owned railway company of Pakistan. Founded in 1861 and headquartered in Lahore, it owns 4,800 miles of track across Pakistan from Torkham to Karachi and operates freight and passenger service. Pakistan Railways was also known as the Pakistan Western Railway from 1947 to 1974. The maximum education require for the jobs in Pak Railways is Graduation. All those candidates who are eligible for Ministry of Pakistan Railways Jobs Via OTS must apply to grab this golden opportunity. Terms & conditions as well as all other requirements for Railways Jobs are describe below. How to Apply For Ministry of Pakistan Railways Jobs Via OTS ? Candidates can download the application form the OTS website. Application form is also available here. Candidates shall submit duly filled Application form, along with deposit slip of prescribed fee in favor of Open Testing Service. NTS test fee which is Rupees 75/- can be pay in any branch of HBL, Alfalah or ABL. Age of applicant should be between 18 to 25 years. 5 years age relaxation will be given according to Government rules. If anyone wants to apply for more than one post, then he must submit a separate application. Candidates must bring original documents at the time of interview. 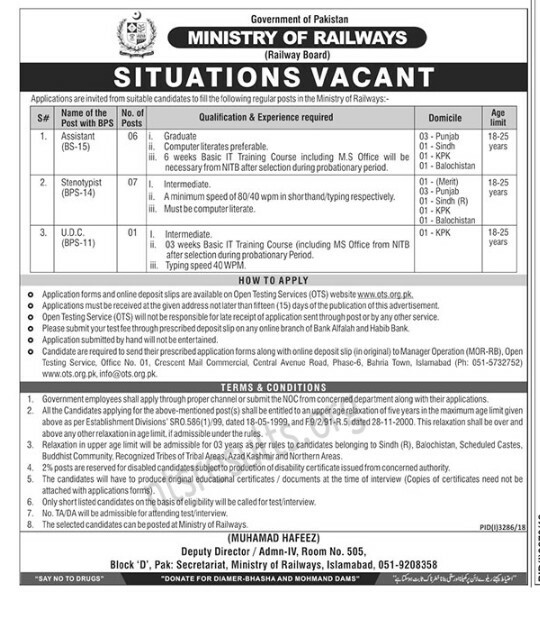 Last date to apply for Pakistan Railways Ministry Jobs is Tuesday, 5th February, 2019.